Amelia had been begging us to send her to Auckland this summer to visit her local friends there on their winter break. She'd met them when they visited her school last year on an exchange trip. It seemed like a great plan, although it sounded like she'd need some logistical support from a parent with a flexible schedule. Which would be me. Of course I've always wanted to go to New Zealand, but I had never thought of Auckland, and certainly not in the dead of their cold rainy winter. Or when we are having such a perfectly flyable summer at home. So I really dragged my feet on booking this trip. Dorothy and Amelia sat down with me and pretty much marched me through each painful step of booking a week and a half trip at the last possible minute, as I groaned and winced at each successive nail in the coffin. When I mentioned the plan to Jon Goldberg a few days before I left he very kindly said I should get father of the year. That made me feel better. To console myself a bit more, even though I had researched it already myself with negative results, I reached out to some Auckland PG pilots for some direct advice on whether it was possibly worth bringing a wing, and if so, which one, XC or mini wing. I got quick responses but mixed advice, and no one seemed hopeful that there would be any flying during our visit. Apparently their winter so far has been more stingy than ours was this year. Not that I had any idea what my daily schedule or free time would be like, since Amelia's plans for socializing were fairly amorphous. So just to double down on my misery at the prospect of a trip to a world class flying destination at the complete wrong time of year, as a chaperone and chauffeur for my logistically challenged teenager, I packed up both wings. I figured I'd martyr myself by lugging them both ten thousand miles across the South Pacific and back. At least they'd get to fly in an airplane! We arrived just in time for a ridiculously rainy first few days. Not our familiar tropical rain but a solid winter cold front battering what felt like a continent sized island. Temperatures were chilly but bearable 50s during the day, and a bit less bearable 40s at night, one night dropping almost to freezing as the cold front passed. I was sure this was going to be the story of the entire trip. We slogged through the puddles around our apartment to explore downtown Auckland in the rain, borrowing a nice big umbrella from our Airbnb host. But as most of you have probably already heard, through the grapevine or through my social media posts, the weather miraculously cleared up for three straight sunny and flyable days after that, and my local contacts guided me to three different fabulous winter soaring spots. They were just as surprised as I was. My main contact Joe called me a lucky charm. The second day was a 35 mile loop along an impossibly straight and beautiful 20 mile stretch of green rolling pastures atop a ridge of sea cliffs overlooking black sand beaches and the Tasman Sea. After the flying at the first two sites turned out so well, he mentioned a new site for the third day and he made sure to get a commitment from me to join him and work my magic. When I reported back to Duck, he said: you should have told them you control the weather! I don't know where people get ideas like that. Mainly I control my copious free time to make best use of the weather. But in Auckland I was at the mercy of their weather and Amelia's schedule, and it still worked out perfectly! After a couple more rainy days, we got to revisit two of those fabulous spots on another couple of perfect weather days, including a slightly wider 40 mile loop this time. On our last day we were actually busy driving around for social engagements on yet another nice flyable day, with locals reporting great conditions at two different sites. Six days out of eleven on the island turned out to be gorgeous and soarable on both sides of the isthmus, and I somehow managed to be there for five of them. I'm so glad Amelia dragged me along on this crazy mission. Now I have to correct Jon in his assessment: Amelia is clearly daughter of the year. 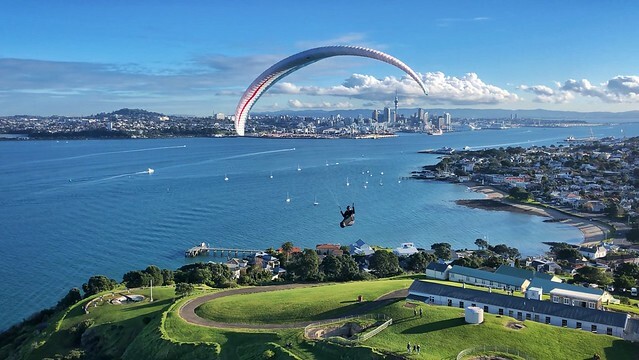 A San Diego buddy, Josh, who'd visited New Zealand himself with less stellar results, commented on my Facebook post that I'd obviously sold my soul to some demonic power in exchange for a lifetime of perfect soaring conditions over the most beautiful landscapes. I don't know if that's true. I've certainly clicked a whole bunch of user agreements online and I have to admit I never read the fine print. Normally I'd try to edit five days of footage from a flying trip into a single concise video. But I just couldn't do that with these clips. Each day was just too pretty in its own way. For anyone who hasn't already seen them on Facebook or Vimeo, here are five videos, one from each day, set to some music I love by a well known Auckland band. Click through to Vimeo for best quality. Ahhh, but the All-Seeing Eye of LiveTrack24 betrayed your location and let us know where you were flying. Mordor surely awaits you on account of the bargains you've made. Buwaahahahhaaaa! I think we need to do a monkey trip to NZ. Apparently we need to bring Alex, as I was there during prime season and only got one flight, but it was great and so was the whole place. The Kiwi fliers will roll out the red carpet for Alex as they had their best winter flying due to his presence. Anyway thanks for the multiple coffee read on this one. I am sure it took Ike days to read this one. I hope to get back in the air soon as my saga continues but light at end of tunnel. Very cool Alex! I enjoyed all those videos. Like Thom I took a wing one summer (09) and only scored one flight at a mound called Puheke in the Far North. I was asking locals if they knew of any grassy hills facing the prevailing winds and a local farmer of "dwarf pineapples" drove me to grassy mound and watched me soar. He said I was the first to ever fly there but I wouldn't be surprised if the Kiwi Hang Gliders had discovered it back in the day. Alex: I finally sat down and watched your videos on the big screen, so awesome. It looks like you could topland everywhere. Nice score. I spent a lot of time in the late '80's and early '90's in Auckland. I did a lot of surfing and cycling there. But no one was flying there then, especially me, I would love to go back.